Why Are 160,000 Kids in North Carolina Without Child Care? I was sixteen weeks pregnant with my oldest daughter, Eliza, when I started touring child care centers. I was just out of my first trimester and wouldn’t need care until the end of my maternity leave in nine months. I figured I was way ahead of the game. However, much to my surprise, I was told over and over that there were no spaces available. Instead, I was placed on a wait list and left to hope for a spot when the time came. I filled out applications at four centers and figured something would open up by the time I needed to return to work. Fast forward six months, and I had a beautiful newborn but still no child care. As my maternity leave ticked by, I grew more and more anxious for a spot. So I went back to the search, cold calling centers and placing myself on more wait lists. In the end, I found care for my daughter about a month before returning to work. But it was a facility that, while fine, was a far cry from the four in which I’d first hoped to place her. Three weeks after starting back to work, I began the search again with the hope of finding the right child care provider for my child, and not just a provider who had space available. Just How Scarce Is Child Care In NC? More scarce than you might think. According to a study from the American Center for Progress, almost one quarter of North Carolinians live in a child care desert. This study defines a child care desert as a ZIP code with no child care centers at all, or more than three times as many children as there are open spaces in centers. In North Carolina, that leaves 160,000 children without easy access to child care. Why Doesn’t Demand Match Supply? One reason for the lack of available child care is the low pay for child care workers in the U.S. According to the latest Census Bureau report, the median wage for a child care worker in 2011 was only $19,098. This makes it difficult for child care centers and programs to hire and retain talent. Another reason is the cost of care. Even if a family does not live in a child care desert, the high costs can keep parents from enrolling their kids in quality child care programs. North Carolina is the 11th most expensive state for child care. In 2015, full-time child care for one child in North Carolina costed an average of $9,255 a year. For a family making the state’s median income, that is a staggering 20% of their yearly budget. Or, as NC Child puts it, one year of center-based care for an infant in North Carolina is more than 38% more expensive than one year of public college tuition in the state. In 2015, the lack of affordable child care centers in North Carolina left over 20,000 children in low-income families on a waiting list for child care support programs. To me, finding the best child care for my daughters is one of the most important decisions I can make for them. 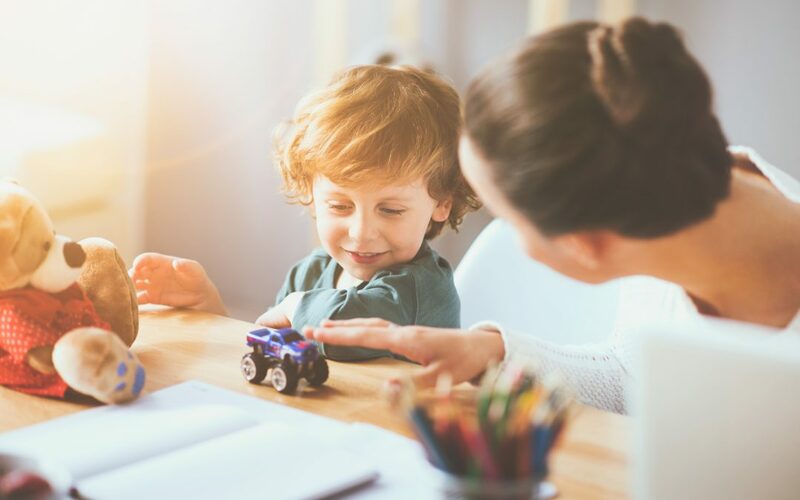 Because both my husband and I work full time (along with 60 percent of families with children under 18), my kids spend as much time with their child care providers as they do with me and my husband. So my daughters’ teachers have a major influence on their development. And research shows that a baby’s brain develops quickly from birth through elementary school, with the most rapid growth occurring between birth and age three. This early development is vital to successful future growth. My children’s child care provides activities designed for each of my daughter’s age group. These activities help my children engage in ways that are suited to their ability and skill level. Child care options that provide educational activities help children prepare for school. I’ve watched my girls develop language and math skills by learning shapes, numbers, colors, letters, animal noises and songs. Child care often allows children to meet others their age and helps them socialize in a comfortable setting. The friends my girls have made are an incredible asset to their lives, and interacting with others their own age allows them to pilot conflict and better understand their emotions. Thankfully, my first experience finding child care was an outlier. I’ve since worked with two great nannies. And both Eliza and my youngest daughter, Vivian, now attend a top-notch child care center where they receive lots of love and the highest quality of care.